Life in the Valley: Does He Really Feel Affection For Me? 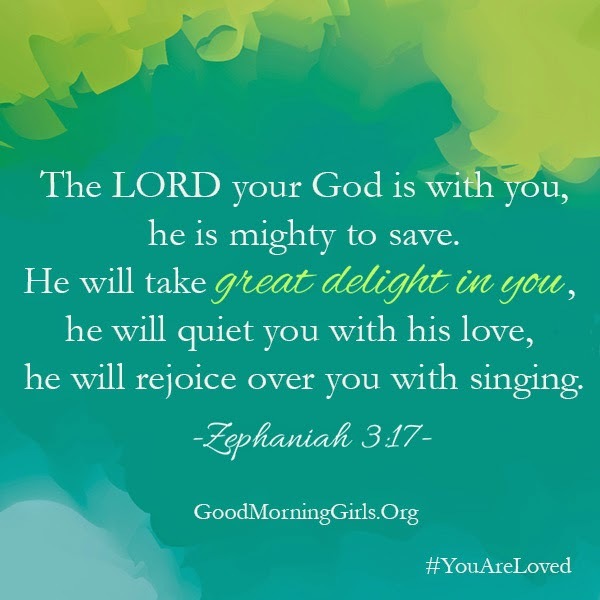 This week in the 'You Are Loved' study, we've been asked to memorize Zephaniah 3:17. I have it hanging on my kitchen wall, next to my painting of a man frozen in perpetual prayer over his soup and bread. Already, the words are etched on my mind and beginning to affect the way I think. I woke up this morning - really early again, thanks jet lag - with the word AFFECTION ringing in my head. Does God really feel AFFECTION for me?! If so, that's a game changer. What a difference it would make in my life if I chewed on and swallowed the truth that the God of all creation, the master of all galaxies and universes, has AFFECTION for me! Yes, yes, I want to believe that with ever fiber of my being, because it is true and it would make a difference in my life. As I lay in bed trying to fall back asleep, my thoughts raced from the word affection to how I'd like to be more expressive in my affection for my husband and kids. Which then led to this: If I want to show affection for those I love simply because I love them, I'll bet God shows affection for me and I need to look out for it. So, here's a challenge for today, beloved child of God. Ask God to open up your eyes to see the ways that He is showing His affection for YOU today. A lover can hardly control his/her expressions of affection for the beloved. The verses above convince me that the Lord does not feel the need to control His expressions for love for us, but we miss them by taking our eyes off of Him, the Lover of our souls. Join me. Take the challenge. Enjoy the affection of the Lord today, beloved! Great challenge! I am weary today and needed to be reminded of this. Oh, the weary days! So thankful for God's Word and hand, and His power to sustain us. Love and hugs and prayers to you, Andrea! !